Barbara (Polk) Washburn of Lexington, formerly of Cambridge and Belmont died Sept 25, 2014. Beloved wife of 66 years to the late H. Bradford Washburn Jr. Loving mother of Dorothy Dundas of Newton, Edward Washburn of Lexington and Elizabeth Cabot of Belmont. Also survived by 9 grandchildren and 7 great grandchildren. Donations may be made in her memory to the Bradford & Barbara Washburn Discovery Fund, Museum of Science, One Science Park, Boston, MA. 02114. Washburn, who was 99, is credited along with her husband, Bradford Washburn, with transforming Boston’s Museum of Science into a world-class institution. The 14,600-foot climb in 1947 took 70 days. She had trained for the climb by pushing a baby carriage, she later said. Barbara Washburn met her husband-to-be when a friend suggest she apply for a job as Bradford Washburn’s assistant when he took over the Museum of Science, then a mere fraction of the facility it is today. He was director of the museum from 1939 to 1980. 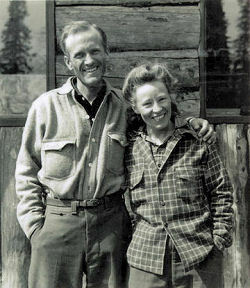 Shortly after they were married in 1940, the couple traveled to Alaska to make the first-ever ascent of Mount Bertha. A year later, the Washburns returned to Alaska and were among the first to climb Mount Hayes. 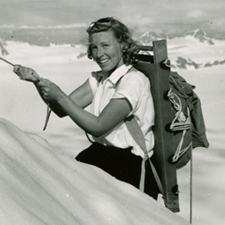 “In later years, Barbara continued to accompany Brad on surveying trips, adding the Grand Canyon, Mount Everest, and the Presidential Range to their list of skillfully mapped terrain,” the museum wrote on its website. The Bradfords donated the land for our OH Cabin.